Annual road trip to locomotives I must see, took me to Depew, New York, to see former CPR Mikado 5361. The locomotive, as most know, is located on a truncated spur, with liquid gas tanks at one end. 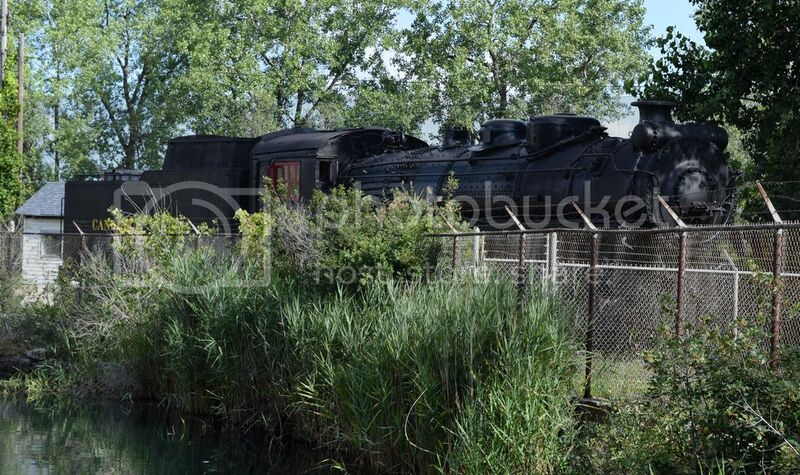 The other is connected to the CSX main by a series of spurs, all of which are in tough condition. What a surprise to see the locomotive has been repainted in a very credible fashion! Finally something good to report! Okay, so is it movable? Yes...and no. Using panel track, it might be wiggled out. Cranes? Best option, but I don't see how to get them into the site. I should also mention, the location is accessible for photos such as you see here. There is an abandoned railway scale house and scale under the lead in tracks. The pit is full of dirty water. Pay close attention to your footing and NEVER go at night. I would also recommend going in with a buddy, for safety's sake. With a coat of paint, I have to say, she looks really good. There are obvious pits in the firebox wrapper sheet. I have no idea of the state in the appliances, but I have been very surprised by the excellent condition of others from MEC 470, so I wouldn't jump to conclusions on this engine. Owner is quoted as saying he will have her cut her up on his death, if somebody doesn't buy her first. Price $100K. From where do people get these valuations? "No coal. No water. Sad!" 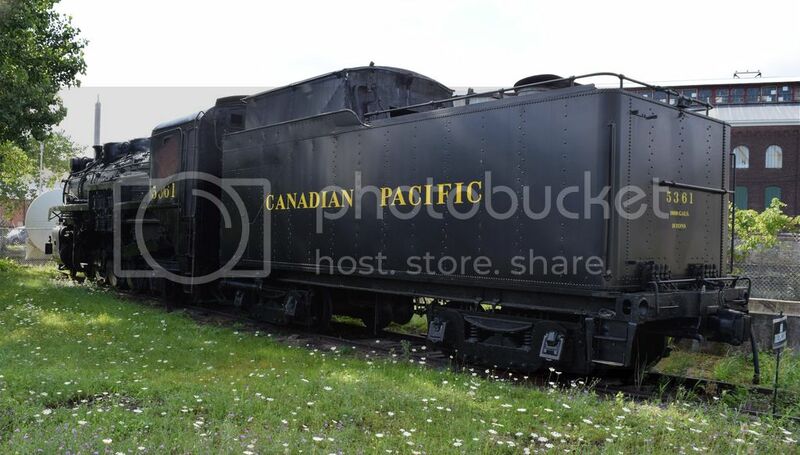 Thanks for the photo essay on the CP 2-8-2. Sure do like all-weather vestibule cabs! 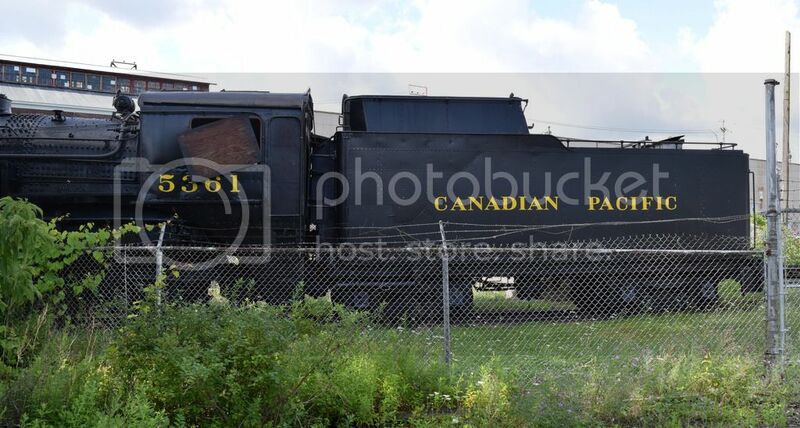 Also thanks for the photos of CN 4-8-4 #6218. Sad to see this engine in such a state. 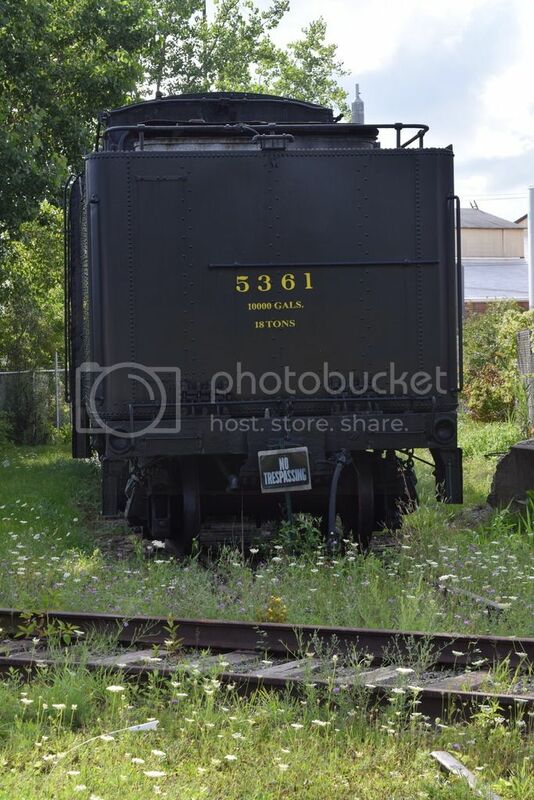 Here is 5361 in much better days, when I photographed her at Chalk River, Ontario in August 1955. Terry and his team (I only assume there is a "team", lol), have done an excellent job in keeping 5361 not only preserved but in pretty nice cosmetic shape. I visited there in June on one of my trips to and from Ohio, and had every intention of posting a few pics just like Richard has done. Thanks for doing so, Richard. She is looking good and is a very good location for the time being. thanks for sharing, she looks in pretty good condition for being out in the open. Anyone know who paid for the paint job? She looks better and the paint will repel some of the water. Update from over on TO: deadline to buy or scrap is this October. Price is still a firm $100k. I know this is not in anyway a USRA locomotive, but it specs seem to suggest it is very similar in size etc to a USRA heavy mike. 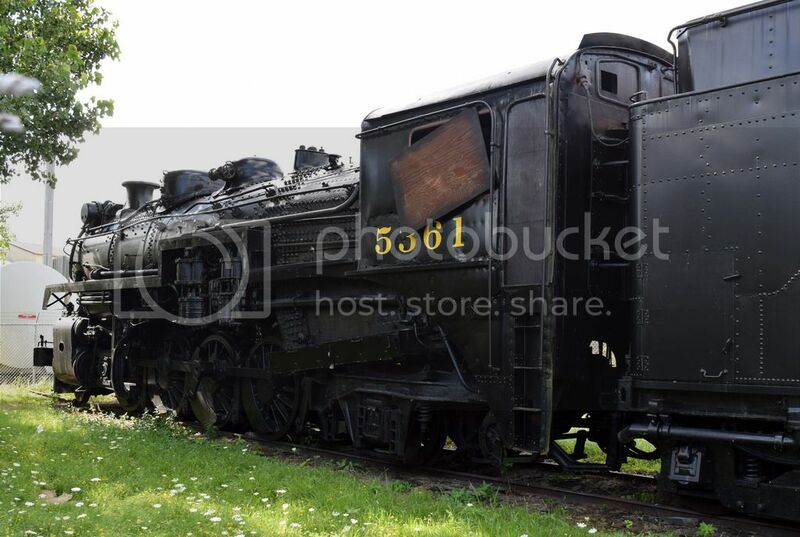 Wonder if some museum might be interested in it as dressing it up as a stand in for a USRA heavy mike. Last edited by CA1 on Tue Jul 24, 2018 1:47 pm, edited 1 time in total. I can't personally see this engine being scrapped. Anything is possible though. Does Kentucky Steam Heritage know about this one? Last edited by BigBoy 4023 on Wed Nov 21, 2018 3:29 pm, edited 1 time in total. Long story is, owner bought it from CPR snow melter service. It was placed on an active siding by C&O or whatever they were at the time. Promise to bring her back to steam failed for the usual reasons, and owner placed a price of $100,000 on her. Supposedly, he has stated that in order to leave the whole of his cash estate to his sisters, if the loco isn't purchased for the said price, he has left order to cut it up on his death, feeding the scrap value to the heirs. In the meantime... one end of the access point has a hydrogen tank of some kind, built on concrete foundation walls. Just the plumbing alone says, it isn't coming out. The CSX now owns the main. The old siding that connected it is soft, rotten, or gone. But... additional panel track could be placed behind the loco, allowing it to be backed up so new rail could be placed in front of it, and the Mikado could be manipulated out. In my estimation, the cost of retrieving the beautiful locomotive far exceeds the scrap price by multiples of ten. The owner is being a jerk, just because he can be, and the locomotive will go to oblivion for shallow gains. Perhaps someone else can correct me. I sincerely hope so. The CSX now owns the main. Unless something very, very screwy has happened in the world of RRing, that never was or is anything to do with CSX. It's the old DL&W main line, now a short line called Depew, Lancaster & Western (if it hasn't been sold). The current DL&W connects to NS at Bison Yard. The current satellite view appears to show the rail still in place, including the switch on the old siding, that got the engine where it is. The only thing missing, besides ties, appears to be the diamond right behind the tender. Since the track that it crossed appears to no longer be in use, I'd think it wouldn't be too much of a stretch to convince the owners to allow the rail to be temporarily removed to reconnect the engine's track to get it out. Who knows - they might not even make you reconnect it once the engine is gone. So if someone wanted to get the engine out by rail it's definitely possible. If you have the funds to acquire and rebuild the engine, you have the funds for a little brush removal and tie replacement. Even if NS wouldn't move it far for you, the engine could be pulled out and moved on DL&W far enough to get to a decent spot where cranes could easily get it up on flat cars. Figure around $60k to get it somewhere if you put it on flats for a long distance move. Sorry for my question but what TO???? TO, mentioned in previous post is 'Train Orders' a pay-to-view forum. Readers on TO were encouraged to visit this RYPN thread, sparking discussion on both boards. Apparently, the $100,000 price is what's required to recover the money the owner has invested in preserving the locomotive so far.